The SATs were a month or two ago, I think. For all the young adults out there who've been thinking about this stuff, here's something: Cheryl Miller is to Lois Einhorn as Chris Rock is to Mr. Finkel. Finkel is Einhorn. 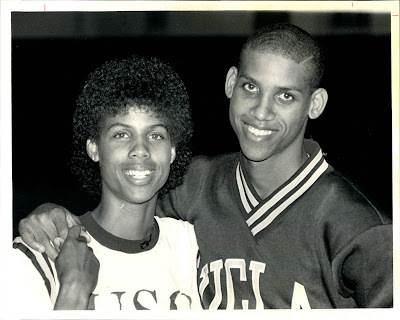 From where I'm sitting, Cheryl Miller is Chris Rock in this photo with, her brother, Reggie Miller.